Genius presents a new plug and play VGA webcam, FaceCam 321, providing a clear, crisp videos perfect for personal video calling. With 8MP image quality and 3X digital zoom, you get bright, sharp videos and razor-sharp close up images. 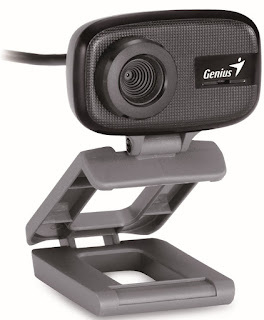 The Genius Facecam 321 is available at the price of USD 17.8 with a warranty of 1year. PNY Technologies a global provider of memory and flash products, has unveiled its latest knife shaped HP v280w USB Pendrive. 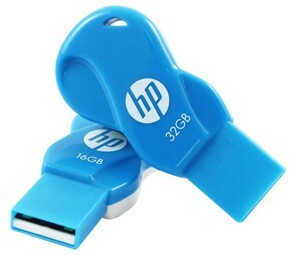 The knife shaped HP USB PenDrive v280w is easy to open and close. Furthermore, its capless design also prevents cap loss and better protects the drive. Using aluminum brushed-metal brings glamour and also durable for long term use. HP v280w offers large capacity (from 4GB to 64GB) for a slim way to store and share all of your digital contents. Compatible with many operating systems and with environmental conditions, HP v280w is also suitable for business and industrial solutions as well. Measuring a mere 53.5 mm x 18 mm x 8.1 mm, this drive is lightweight at just 12.25 g, making it compact and portable. The HP v280w is available in capacities of 4GB, 8GB, 16GB, 32GB and 64GB. The drive has a USB 2.0 interface which is backward compatible with older USB ports. 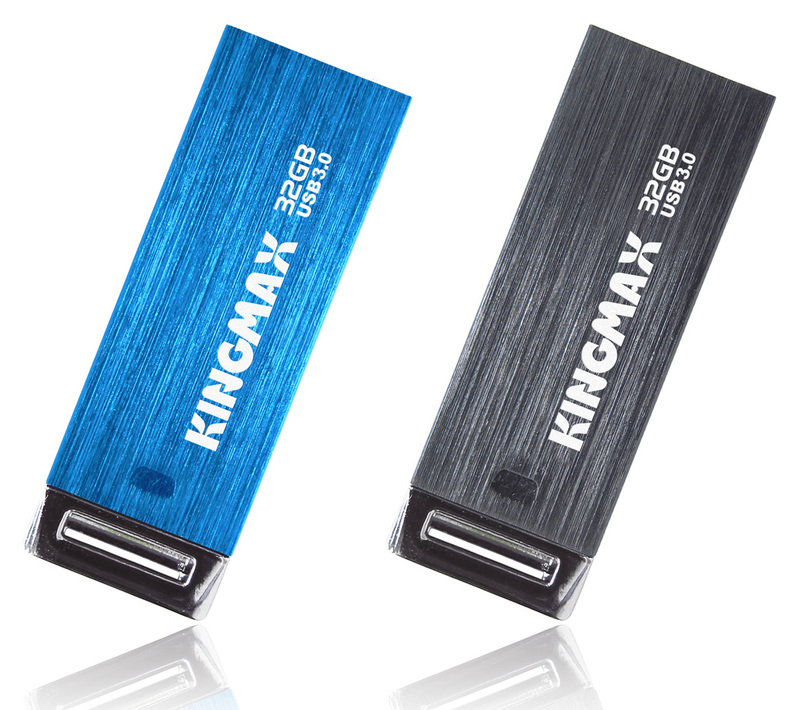 KINGMAX is excited to announce the launch of its remarkably compact, ultra-fast COB USB3.0 Flash drive. The UI-06 features high read and write rates and are built to last thanks to the waterproofing and dustproofing capabilities of PIPTM technology. The hardware is protected by smudge-resistant sandblasted metallic casing and is available in blue or gray. Market trends and user demands call for portable storage with faster transfer rates, ever more secure data storage, higher capacities and heady design. As a leading manufacturer of COB technology, KINGMAX has combined faster components and dynamic compatibilities to create the powerful, pocket-sized UI-06. Highly efficient COB packaging techniques use only 8.8% of the space of a traditional SMT-type USB while the hardware retains a peak read speed of 85MB/s and a maximum write speed of 22MB/s. This latest upgrade is backwards compatible with USB2.0, facilitating seamless transfers. Available in a range of capacities - 8/16/32GB - the UI-06 accommodates mobile storage of files of nearly all sizes. Keeping the UI-06 attached to a keyring, work lanyard or laptop case allows users to take their data everywhere. Appreciate the combined aesthetics and utility of the recessed lanyard loop and sandblasted metallic blue or gray finish. Consumers can rest assured that data is safe from water damage or dust interference thanks to Product in Package (PIP) technology. All KINGMAX products follow strict quality standards and have been 100% tested under strict quality control systems to ensure the durable performance before shipping. Moreover, the KINGMAX products are backed up warranties and global customer service to guarantee the highest level of customer service satisfaction. PNY Technologies, considered one of a worldwide leader in Memory and Flash products, proudly welcomes the coming year 2013, the year of Snake (in Chinese calendar), with the new limited USB Flash Drive: PNY M1 Attaché Snake version. This Flash Drive includes 3 factors that users should not ignore: beautiful, unique and limited. The PNY M1 Attaché snake version features a capless design with unique ink stroke pattern covering the surface, symbolizing a snake in a upscale sleek and rigid metal case. Its housing came with matte finish and offers fingerprints free feature. And also provide the water and shock resistant ideal for your long term use. The snake version is small enough to carry everywhere when attaching in your keychain or an accessory for your necklace. Oppositely, it also big enough to store your must-have data beside you. The device is not as a normal Flash Drive when PNY manufactured limited quantity in the way of "snake". Attaché maybe iconizes your birth designation and brings your good luck in the coming year. The PNY M1 Attaché is available in capacities of 8GB, 16GB and 32GB. The drive has a USB 2.0 interface which is backward compatible with older USB ports. PNY is proud to ensure 5-year warranty for the highest quality of this limited Attaché. PNY Technologies®, Inc. (“PNY”), proudly informs its successful showcase at the 32th India International Trade Fair 2012 (IITF 2012) at Pragati Maidan, New Delhi, India from 14 to 27, November 2012. PNY brought to the fair wide range of its latest products, including USB PNY Flash Drives, Flash Memory Card, ear phones, IT peripheral, and HP Flash Drive. With the philosophy of user-oriented design with a strong personality in all kind of products, PNY showcased mobile storage solutions which visitors could fall in love at the first sight. The PNY Attaché series add an useful function to their storage role, like Opener Attaché, Mini Hook Attaché… HP USB series still ensure their stability with sturdy case. Memory modules and Solid State Drive (SSD) products also draw lots of attention from users. IITF is the annual IT Trade Show in India and PNY is still among over 350 companies from 20 countries joining in, with the ambition to bring more choices for end-users in mobile storage market as well as IT peripherals. Through this exhibition, PNY can know better what Indian users want and expect for their needs. Thursday, December , 2012: Taiwan based Genius is an international leading company in computer peripherals launched the next generation 2.4GHz wireless multimedia keyboard and mouse combo from Genius KB-8005. This combo kit offers reliable 2.4GHz transmission for longer operational distance and anti-interference. The low profile keycap structure provides maximum typing comfort and a quite typing experience. There are six hot keys for media control and internet access, giving one touch controls so one can accomplish tasks faster. 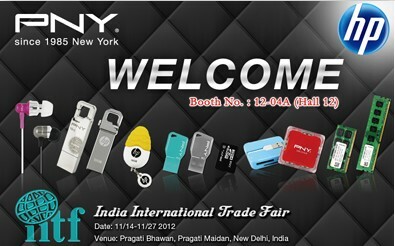 PNY Technologies® (“PNY”) participated in the IITF, the largest trade fair in India, The 32nd India International Trade Fair 2012 at Pragati Maidan, New Delhi, starts from November 14 and last till November 27 for 2 weeks. This year the fair presents international exhibitors over 350 companies from 28 countries. PNY one of the worldwide leader in Memory and Flash products, is presenting its wide range of product line-up of USB thumb drives, flash memory card, ear phones, IT Peripheral and HP flash products, to the international and local Indian visitors at this fair. PNY is well-known for their class high performance flash products, visitors to PNY booth will find the various range of products in memory and flash products. Designed to stand up to the most demanding applications with variety of outstanding housing design, PNY delivers the quality, and reliability to match for the market need. PNY Product qualities are reliable, affordable, and geared towards consumers' needs. With products geared towards Mobility, Photography, Gaming, and Business solutions, PNY's products function with a wide variety of computer and digital devices. PNY booth located at Hall 12, booth no. 12-04A. The authorized distributors of PNY - Fortune Marketing Pvt Ltd., and Balaji Solutions Ltd. are attending together. Different kinds of special designed USB thumb drive such as Solid Metal, Swarovski Crystal, function design series - opener, hook, clip attaché USB drives, and fashionate IT peripherals such as multi-function card reader and elegant earphones are displayed. PNY Technologies has launched the new HP v180w with a very different philosophical message. Designed to appear like the infinity "∞" symbol, this USB pendrive attempts to deliver the message of infinite love and peace, which is very much necessary in this era where there is so much negativity around because of natural disasters and other things going around. The HP v180w's refreshing cool blue color is yet another subliminal way of delivering the same message. 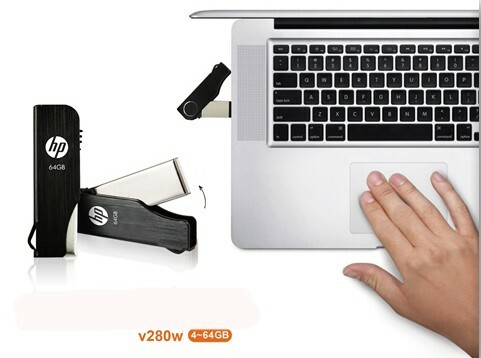 The HP v180w is made of strong polymer that even covers the tapering front USB plug, protecting it against corrosion. While most of the surface is glossy, the end where it is required to hold it has been intelligently given a matte finish to make it easier to retrieve it from the port. The cap-less design ensures that you don't have to worry about losing the cap. Measuring a mere 8.0 mm x 21.0 mm x 44.1 mm, this drive is incredibly lightweight at just 2.62 g, making it very compact and highly portable. The HP v180 is available in capacities of 4GB, 8GB, 16GB and 32GB, allowing you to easily carry and share your music, photos, videos, and other data with your friends. The drive has a USB 2.0 interface which is backward compatible with older USB ports. HP v180w assures a minimum read speed of 14 MB/s and write speed of 4 MB/s to ensures that you don't waste too much time during data transfer. Taiwan –based Genius is an international leading company in computer peripherals introduces the Genius GILA MMO/RTS professional gaming mouse. GILA is the next generation MMO/RTS professional gaming laser mouse for the GX Gaming series. gaming challenge and improve combat performance. game block and gives gamers 1-ms (8X quicker) response time. The Braided cable and gold-plated USB connector provide a stable and smooth signal connection during battle combat. A reliable eight million life clicks give MMO/RTS gamers a comfortable button feel, and the adjustable weight design includes six metal weights – each 4.5 grams, customized to improve battle performance. Gila not only allows the X/Y axis dpi to be independently adjustable, but it includes the “Angle Snapping” function that instantly raises cursor precision at high speeds, and the “Sniper” button that instantly reduces the dpi when you need it. Gila uses the Scorpion user interface so gamers can setup “Button Assigment”’ “Macro Management” for up to 72 keys, “Advanced Setting” to customize mouse performance and the “Light Option” that instantly reduces the dpi when you need it. MMO/RTS game oriented, comfortable design with a superb hand grip and outstanding performance in all games. KINGMAX has launched the world’s most revealing COB (Chip-on-Board) type USB flash drive. Flash drive UI-05 features dynamic casing design in which the chip is housed under a clear glass ceiling that is both waterproof and dustproof, made possible with PIP technology. Innovative imBGA engineering allows the glass casing on the top side of the UI-05 to reveal the drive’s inner flash die and wire-bonding structure. reminds users not to leave the drive behind. spans a range of capacities, including 8GB/16GB/32GB. KINGMAX’s own package technology has made it possible for the UI-05 to become the world’s 1st glass-ceiling USB flash drive. UI-05 flash drives meet or exceed RoHS regulations (Restriction of hazardous substances in electronic and electrical and electronic equipment), CE, FCC and BSMI requirements. All KINGMAX products follow strict quality standards and have been 100% tested under strict quality control systems to ensure the durable performance before shipping. as high as 320MB/s. Capacities come in 32GB, 64GB and 128GB. With the diverse development of the Ultrabook, the mSATA MMP30 SSD provides system integrators or manufacturers another excellent selection that is both economical and that includes high performance. In addition, the MMP30 solid state drive has lightweight and compact features, and complies with JEDEC MO-300B specifications, which makes it suitable to apply in Small Form Factor or embedded systems and also the currently popular tablet PCs. 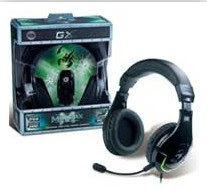 Genius is an international leading company in computer peripherals unleashes the GX Gaming “The Mordax ” its new universal gaming headset for PC, Mac, Xbox and PS3 system. Pro gamers play games on multiple platforms, so the Mordax comes fully –loaded with the audio artillery needed to deliver explosive sound quality on each respective system. The Mordax features a built-in amplifier and 40mm neodymium driver unit to generate chest-thumping bass performance. Additionally, the Mordax also supports platform-specific chat functionality via a detachable microphone that’s both adjustable and easy to store.